The first Zenit was based on the Zorki rangefinder camera. In transforming the Zorki into an SLR, the simplest possible approach was taken: the rangefinder housing was removed from the top and replaced by a ground-glass screen and prism; a mirror was added below, with a rope-and-pulley setting system and the M39x1 thread mount was pushed forward to make room for the mirror inside. During 1967 through 1969 KMZ built an automatic die-cast moulding line, allowing mass camera production. Camera production switched to the M42x1 thread (also known as P-wire or Praktica thread) and an instantly-returning mirror was also developed. This led to one of the most famous Zenits -- Zenit-E which saw (including its subtypes) over 12 million produced. The first attempt to make high-end professional camera by KMZ was the Start in 1958. This camera had a full set of shutter speeds (from 1 sec to 1/1000), a lens with an automatic diaphragm in a unique breech-lock mount, and even a knife for cutting-off part of the unexposed film. The photographer could choose between a pentaprism and waist-level finders. However, the camera was too complex and too expensive for the Soviet market. Zenit's next attempt was the Zenit-4 (1964), -5 and -6 cameras. These were based on a Voigtländer Bessamatic-type mount with focal-plane shutter. The Zenit-4 was one of the first KMZ cameras to come with a lightmeter. The Zenit-5 was the first Soviet motor-driven camera, and the first Soviet zoom lens (Rubin-1c 2.8/37-80, based on Voigtländer Zoomar design) featured in the Zenit-6. Following this, there were two more attempts to make high-end protographic equipment, namely the Zenit-7 (1968) and Zenit-D (1969). Both were based on the completely new cloth-curtain shutter construction. The Zenit-D had automatic exposure mode (the first such camera in the USSR). Its shutter was speeded-up to achieve X-sync at 1/125. Each of these had its own bayonet mount ("mount 7" and "mount D" respectively) which helped to utilize the camera's most advanced features. There were plans to develop a full line of optics for these cameras but the new shutter was too complicated and unreliable. Production was cancelled shortly after, and the only lens made for new mounts were the standard types. Ironically, the Start, Zenit-7 and Zenit-D utilized the same normal lens -- a Helios-44 2/58. The Zenit-D is the rarest Zenit camera -- only 63 cameras were produced. After one more unsuccessful camera (Zenit-16) which was produced in very small quantities, in 1979 production of the Zenit-19 began. This was a camera with an original electromagnet-driven focal-plane shutter, M42 lens mount, and shutter speeds from 1 sec to 1/1000. X-sync at 1/60 or 1/125 (camera was modified during production). The camera has only manual shooting mode (with a TTL-meter and a needle indicator of the proper exposition in the viewfinder). The Zenit-19 was, perhaps, the top-of-the-line Soviet M42 lens mount camera. 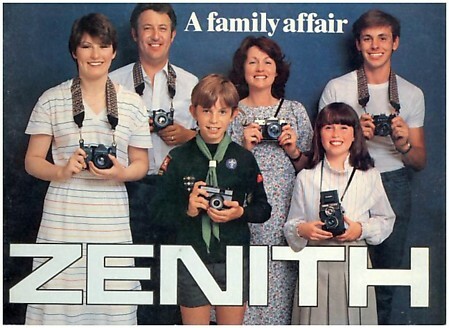 In 1984 the Zenit-automat entered production. This had a Pentax K mount (which was proposed as an open-standard by Pentax and distributed freely) and a focal shutter with horisontal-travel cloth curtains. The only operation mode was aperture-priority. The camera was modified in 1988, to include shutter FZL-84 with vertical-travel metal curtains, and was reissued as the Zenit-AM. The Zenit-AM2 was a cheaper version of the AM without the self-timer. Next in line was the Zenit-APk. Its distinguishing feature was the introduction of a manual shutter mode in addinion to aperture-priority. The original FZL-84 shutter was also changed to a licensed 'Copal Square' shutter. The Zenit-KM plus was the final Zenit camera to be produced; as of 2005 all SLR camera production at the KMZ (Krasnogorskiy Mekhanicheskiy Zavod) factory ceased (source: http://en.wikipedia.org with some corrections from the creator of this website).